Katrina Small is an award winning fine artist. 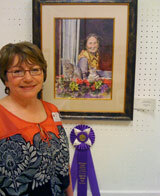 She began painting as a teen and today produces works in watercolor, pastel, oil and acrylics. She works full time as an artist and designer (see KatGrafix), specializes in portraits and is available for commissions. 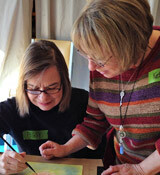 Katrina gives private and semi-private instruction. 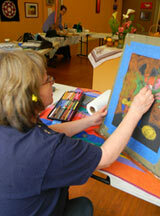 She is also available to give demonstrations to art clubs, schools and special events. Call or email her for more information. Katrina Small worked as a graphic designer and illustrator for a toy company for 11 years during the '80's where she found her field changing to a virtual technology. After a series of life journeys that brought her toCalifornia from Colorado, she found herself back at school earning the knowledge necessary to be competitive in our digital world. She offers her services as a graphic and web designer and as a producer of e-marketing presentations. To view her commercial art website visit KatGrafix.com. After wanting to find resources in Sonoma County on the internet that would support her artistic endeavors and not finding many, she created a website called Artists' Resources in Sonoma County. This website is a listing service and has become very popular, attracting local and international artists, galleries, and supply houses. Q2, Sebastopol Apple Blossom Festival Fine Art Show: First Place Oil, "Ducklings"; Award Winner, Pastel: "Peek 'n Boo"
Q4, Sonoma County Harvest Fair Fine Art Exhibition: First Place: "Autumn Vineyard" Oil, Award winner: "Herd it Through the Grapevines"
Q2, Sebastopol Apple Blossom Festival Fine Art Show: First Place Watercolor, "Fleur de Feet"; Second Place Oil: "Bee-utiful!" Q1, Commissioned to produce a watercolor painting called "Pears" for Quarto Publishing entitled "200 Tips, Techniques and Trade Secrets for Watercolour Artists"
Q4, Sonom County Harvest Fair Fine Art Exhibition: First Place: "Bee-utiful! "Oil, Second Place: "Rosso & Bianco #3"
Q4, "Apples and Blossoms" (Watercolor) selected by a vote of members of The Art Workshop of Western Sonoma County (AWS) to be the first collectable print representing the Sebastopol Apple Blossom Festival Fine Art Show. Q3, Abramson Gallery, Mendocino Art Center, Mendocino, CA, "Rosso & Bianco #3"
2012, 3/5-5/1, all-media painting classes, with individual attention. 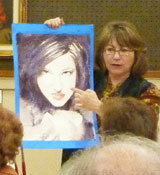 2011, all media painting classes, with individual attention. 2007, 12/17, Portrait Workshop: "Transforming the Mundane and Ordinary into Spiritual and Magical"
Commission Katrina to create a painting for you. Call 719-557-9997, or email Katrina@sonic.net.